Glenavon assistant manager Paul Millar considers the club’s multiple connections to Northern Ireland under 21s as confirmation of a successful youth strategy. Rhys Marshall and Joel Cooper have been selected for EURO 2017 qualifying fixtures against Scotland (Saturday) and Iceland (Tuesday), with James Singleton on the standby list. However, links to the international panel extend beyond the current crop of promising young Glenavon players. “Robbie McDaid and Gary Lavery both went across the water from Glenavon, plus Shayne Lavery is currently injured but around that international scene,” said Millar. “It is a testament to the hard work put in by everyone and Gary Hamilton’s commitment to youth. “We try to approach it from every angle, with player progression first and foremost the priority for our reserves. “Then you have players moving into professional football as teenagers and the number of scouts at our games is testament to Glenavon’s reputation. The international recognition has led to a date switch for the Mid-Ulster derby trip against Portadown from Saturday to September 22. Scotland will face Northern Ireland at Mourneview Park on Saturday from 2 o’clock. 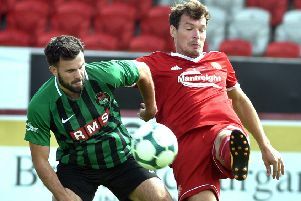 “We have a free date now but it is coming off the back of our first home point of the season last Friday against Glentoran,” said Millar. “It is testament to our progress that Glentoran came to Mourneview Park and basically parked the bus to hit us on the counter-attack. Glenavon’s next Danske Bank Premiership test will be at home to Coleraine on Saturday, September 12.